The performance of multifocal IOLs is based on their establishment of diffractive zones. The different number, height, interval and width of the rings affect patient total visual outcomes under lower light conditions. Diffractive multifocal IOL engineering is based on balanced light energy between foci. Narrow rings increase the near addition. Conversely higher steps enable the transfer of more energy to near focus. +3.75 D near addition in Reviol’s Active-Diffractive Optic has the appropriate balance to provide better intermediate visual acuity. Near addition is crucial in energy distribution through near to distance focus. Insufficent near addition results in inadequate disparity between foci, which causes blurring vision at intermediate focus. Excessive near addition eliminates focus overlapping and provides sharp near and distance vision. On the other hand reduced visual performance may result, which causes difficulties in patient adaptation. 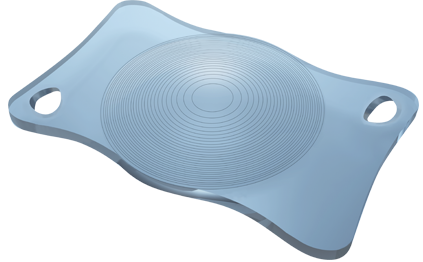 Reviol’s all enhanced square edge and premium material form a dual barrier against PCO formation after implantation. The aspheric design of the Reviol “UD technology” compensates for the positive spherical aberration of the cornea while preserving depth of focus. AcrivaUD Reviol has a full range of diopters from 0.00 D to +32.00D, in 0.50D increments. Special production is from +32.50D to +45.00D in 0.50D increments.